Picking out the right Christmas gift for your significant other can be the toughest challenge! For your boyfriend, it’s got to be the most original gift in existence – you want to surprise him with something that’s unique and unsurpassed. And after so many years together spent side by side, coming up with a totally new gift idea can be incredibly tough! Maybe this year the best idea is to create something exclusively for him. Something special that’s able to express you deepest feelings for your man. 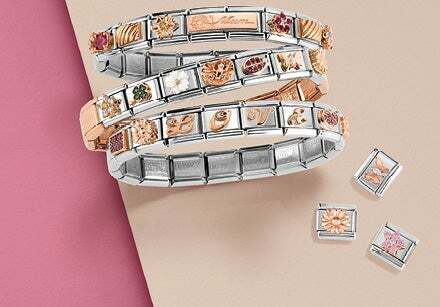 Why not choose customised jewellery with your message of love written in metal for an unforgettable gift? Nomination offers an amazing selection of jewellery for men as the perfect Christmas gifts for boyfriends: high-quality accessories made from precious materials such as stainless steel, gold and silver, perfect for any occasion. Think back to your last trip together and choose a Composable Link to add to a personalised bracelet to give to your guy: flags from every country in the world tell the story of an unforgettable journey… or it could be the starting point for a new trip together! If your man loves rock, choose a Composable Steelikons bracelet: the stainless steel used to make this bracelet can also be burnished and decorated with studs and skulls: a precious gift that doesn’t compromise on personal taste. Looking for a more classic Christmas gift idea? For your boyfriend, you can never go wrong with a watch: a timeless men’s accessory, you can also choose a version that’s more casual and contemporary thanks to the wide offering from the Time Collection by Nomination. If you’re looking for an idea for a truly original romantic Christmas gift dedicated to your guy, opt for jewellery that’s created just for him. Express your love like never before with men’s jewellery by Nomination! 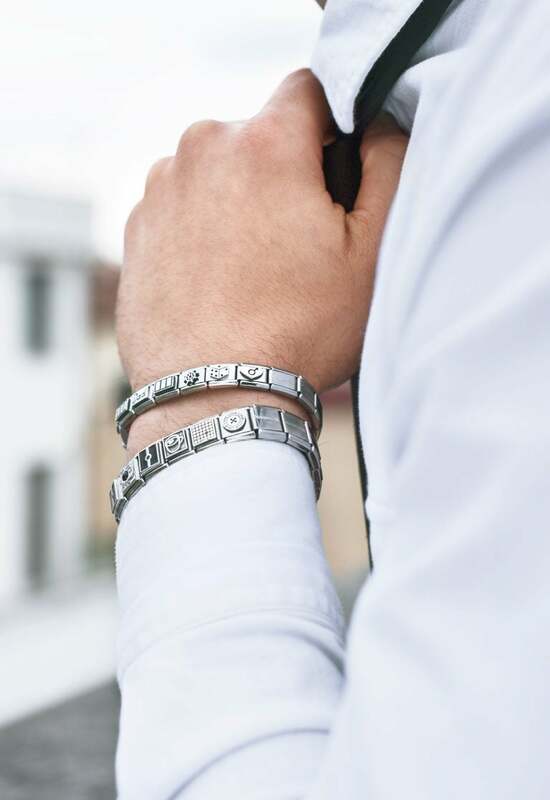 Choose one of our Trendsetter bracelets for him: with many models, the steel plaques allow you to choose a personalised engraving for the reverse, dedicated to your special Him for a magical Christmas in 2018. Or build a Composable bracelet personalised for your boyfriend according to his tastes and the messages you want to leave for him. 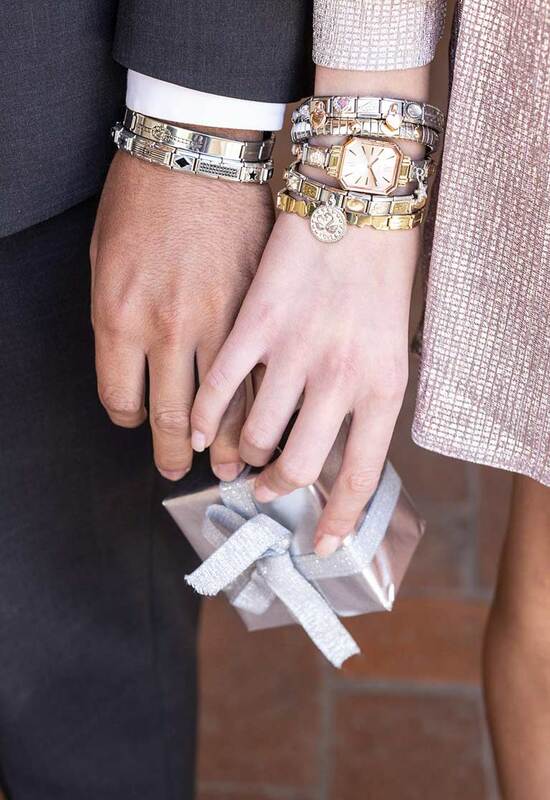 Choose from a variety of precious Links and create original jewellery that’s very much one-of-a-kind: from gold letters used to write out his name or a true declaration of love, to romantic symbols that represent your love story. There’s the plaque with “I Love You” engraved, the Link with a red heart and a scroll with “Ti amo”, the plain gold Double Link to have embellished with your customised romantic inscription or the Double Charm with the affectionate phase, “I Love you to the Moon and back”. 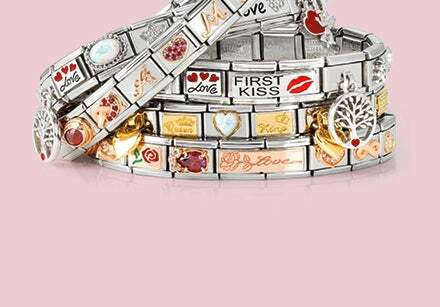 Choose your favourite Charms and create an original Christmas gift for your boyfriend!